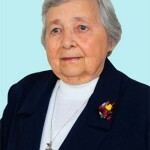 Sr. Maria Mikaila was the fifth child of R. Paulus Tamadipoera and R. Ngt. Ignatia Soedjinah. They named her Catharina. Her parents had three sons and four daughters. Ambarawa was the place where she lived and grew up in a Catholic family. She received baptism on the day of her birth and on June 20, 1947 she received the sacrament of Confirmation in her parish, St. Joseph in Ambarawa. During her childhood she lived separately from the family who had to evacuate because of the war. In God’s will they were reunited after returning from different refugee camps. Catharina went to school and was trained as a nurse in Pekalongan and Solo. The seed of her call grew since she was 16 years old. Her dream was to live a “perfect live” through consecrated life. It became a reality when she entered our Congregation as a postulant on January 8, 1956. 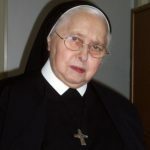 On the day of her investment on July 14, 1956, she received her religious name: Sister Maria Mikaila. After first profession Sister M. Mikaila was missioned to Kraton Hospital (a hospital formerly owned by the sisters). 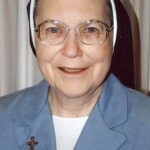 She continued to become more mature and made her perpetual profession as a Sister of Notre Dame on July 2, 1964. 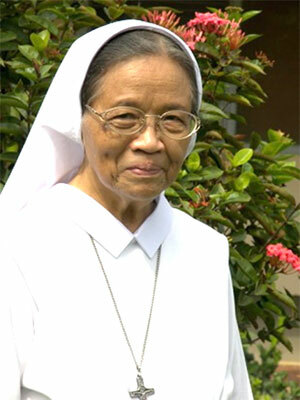 In her ministry as a nurse, Sister M. Mikaila, in the tender care for her patients, showed a special motherly touch. This characteristic was also evident in her life as a Sister of Notre Dame. She served patiently in the Clinic in Rembang until entering her well earned retirement. In 2012 Sister Mikaila started living in Wisma Hana, our infirmary in Pekalongan. The decline in her health was caused by ovarian cancer from which she had been suffering for a long time. Her devotion to the Divine Mercy was part of her life during her illness, as she offered herself and all souls to the true perfection of Jesus. Her strength sincerely declined since November 2014 and she suffered until her last days, uniting in spirit with the great suffering of Jesus. 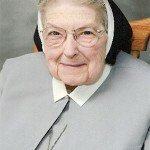 On Sunday, January 21, at 2:00 am, she went home to God accompanied by the prayer of her co-sisters. May her soul be united with the Divine love of Jesus.